Shelly Rogers-Sharer is a licensed professional counselor by day. By night (or technically by afternoon + evening), she runs a giant indoor bounce house playground for kids. Jump-N-Place was opened in 2008 by a family who had seen something similar in Houston and decided to introduce the concept to Waco. In 2016, Shelly and her husband Steve purchased the business, much to the delight of their two boys. Shelly shared with us what she (and most parents) love best about Jump-N-Place, what’s in store for the future of the venue, and how they’re listening to YOU. How did you end up taking over Jump-n-Place? What are the benefits of a place like Jump-n-Place? “A huge benefit is whether it is freezing cold or smoldering hot - because we can have that from one day to the next here in Texas - it's an indoor playground where children can run and get energy out. But it's in an encompassed safe environment. 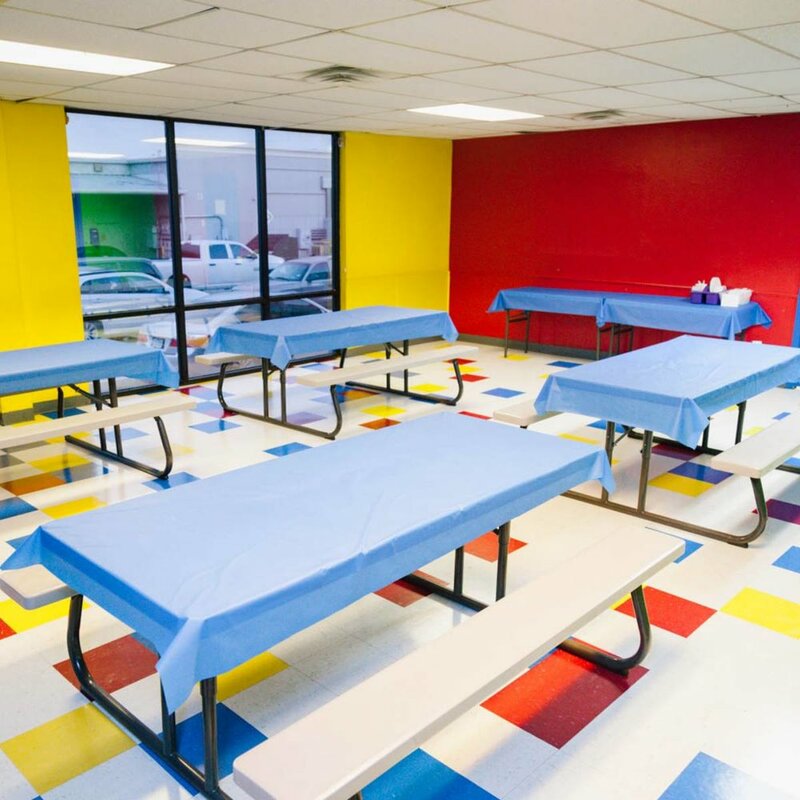 The number one thing we hear is that parents can sit at a table and work (we have free Wi-Fi) and they can see from the center everywhere their child might be in the facility. So they can sit and let their child just run and jump and play and get their energy out even on those cold or hot days. What kind of lessons do you hope to teach your boys through this business? “For my oldest son: He is very much an entrepreneur by mind. He's always been the kid that wanted to sell lemonade or he wanted to collect stuffed animals one time. He's always coming up with ideas for either selling or doing charitable contributions for people. But sometimes he puts on the t-shirt and lanyard, and gets bossy. Like he thinks he's in charge. I've had to really teach him that as a business owner, it's not about being in charge or saying, ‘This is mine.’ It's about customer service and respecting others and trying to meet the needs of the community. And its been interesting to try to get that developed in him. That must be a kid’s dream to have your parents own a place like that. “At times, owning it is a lot of fun. They love showing it off to friends, bringing their friends up there and playing. But because it’s taken so much of my time, there are times they’re like, ‘Oh Mom, do we have to go up there?’ It’s almost gotten routine or mundane for them. We’re actually selling it due to a family illness, and as soon as we told the boys we were needing to sell it, they were in tears crying because they’re going to miss it. But we’re doing what we need to do for family, family comes first. So what’s in the future for Jump-n-Place while you still have it? “At the first of the year we increased our prices because we want to make some improvements and grow. I just bought all new tables, and we’re hoping for a concession stand and a little coffee bar. Also, we’d been hearing from people that some of the inflatables are getting old, that they wish we had something new. So we’re trying to make that happen, but in order to buy new things and make those improvements, costs have had to go up. But I want to make sure our customers know about all the coupons out there. We have coupons going out from Towny, from Locals Love Us, from Hooray for Family, and on our own website. And please look for our half-price Thursdays, that’s something new that I really encourage people to take advantage of. We also have family night on Fridays. As of January 1, we have new party packages, because some people were saying some of our packages were expensive and we didn’t have anything for smaller parties. So these are things that are good to know. We are trying to listen to our customers and improve what we have to offer them. Keep Jump-N-Place in mind next time your kids are bouncing off the walls or celebrating a birthday. Before you go, you can find special deals on Towny, the free online (or on your phone) guide to exploring Waco + shopping local. Earn perks for supporting your fellow Wacoans!